Does Watson Herald The Future of Multiplayer Gaming? 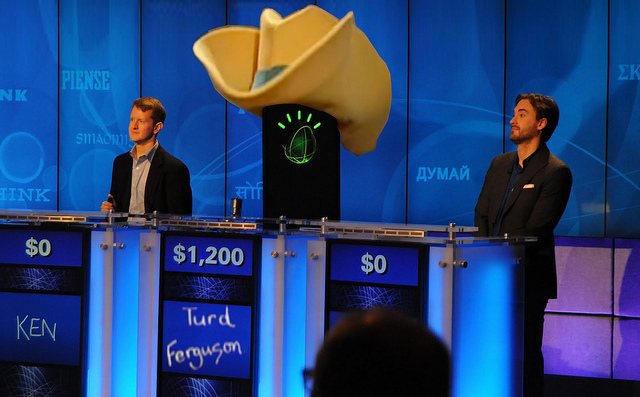 Home » SideQuesting » Does Watson Herald The Future of Multiplayer Gaming? I was watching Jeopardy this past week and saw a computer, named Watson, dismantle the previous Jeopardy record-holders. Ken Jennings and Brad Rutter didn’t stand a chance against the quick-processing computer. Even in loss, though, Jennings and Rutter still managed to answer some questions that Watson couldn’t, even beating the PC to the punch on several occasions. One thing that stuck in my mind afterwards was that even though a third human wasn’t there, Jennings and Rutter were able to treat Watson as an equal contestant, regardless of his lack of blood & guts. Could this respect transfer over to videogames? While we play against AI opponents all the time, none act like “real people”. No bots engage us, none get us feeling as though maybe there is someone there pulling the strings. We never feel like what we’re interacting with is “real”. It’s just a series of blips on an radar. But with advances like Watson, the “next generation” of consoles is begging for vast improvements in AI. There’s a chance that multiplayer gaming and single-player campaigns will be much more interactive instead of a tunneled map and a cover system for easy kills. Perhaps the stand-off between a typical grunt and a space marine in Halo 6 will take 10 minutes instead of 10 seconds, as the enemy actually hides, takes aim, or protects itself, making the one-on-one battles much more interesting and real. Either that, or they’ll slaughter us each time.